Finn Harps' Raffael Cretaro during the warm-up prior to a recent Shamrock Rovers match. RAFFAEL CRETARO EXPERIENCED a strange sensation recently. All of a sudden, he found himself lining up against the team with whom he previously spent 17 seasons. At 37, Cretaro is one of the oldest players in the League of Ireland. His Italian father, also named Raffael, moved to Ireland over 40 years ago and married his mother, an Irishwoman that he met in Ballina. Originally based in Dublin, the family soon moved to Tubbercurry, where the young Cretaro grew up. Sligo is consequently where the striker considers home. And through his footballing talent, he subsequently endeared himself irrevocably to the local community. He first joined the Bit O’Red as a teenager in 2000 and spent the majority of his career there, with the exceptions until recently being the 2006-07 and 2010-11 campaigns, when he lined out for Galway and Bohemians respectively. So Sligo will always be where Cretaro’s heart lies and he ultimately became a club legend there. In August last year, he surpassed Tony Fagan as the club’s record appearance holder. In total, Cretaro scored 86 goals in 531 matches for the Showgrounds outfit. He helped Sligo win the 2012 Premier Division title, only the third league triumph in their history and first since 1977, as well as the 2010 and 2013 FAI Cups. So with all those achievements to his name, you might assume Cretaro would be more than content to hang up his boots, in the process exiting what is becoming an increasingly youthful and physically demanding league. But after waving an emotional goodbye to Sligo last December, he signed up with newly promoted Finn Harps for yet another arduous season in Irish football, 19 years on from his first, when he started out as a makeshift right-back before establishing himself as, in the words of Bit O’Red chairman Martin Heraghty, “the most feared striker in the league”. With Harps this season, however, he has been mainly deployed in an attacking midfield role just behind the forwards, while he has played virtually everywhere “bar in goals” during his lengthy stint in football. It’s been seamless enough,” he says of adjusting to his new surroundings. “That’s probably down to everybody at the club — the manager, his staff, my team-mates and everybody involved. “It’s felt like I’ve been here longer than I have been. 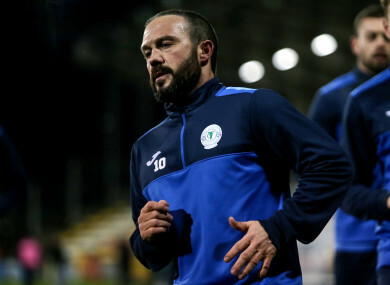 Having gained promotion from the First Division last year, many critics expected Finn Harps to struggle amid their return to the top flight and the early signs suggest they could be in for a tough season. The club currently sit second from bottom, having taken just two points from their opening six games, despite the pre-season recruitment of Cretaro. However, the Tubbercurry native believes the team are better than their current position suggests, citing the draws against two of the most impressive-looking sides in the league, Dundalk and St Pat’s, as reason for optimism. The Sligo encounter earlier this month was particularly frustrating and slightly surreal at the same time for Cretaro. “It felt weird playing against them. It’s well documented the fact that I’m a Sligo supporter, but I was lucky enough to play against the team as well. Even at this early stage of the season, tonight’s fixture feels like an especially important clash, as Harps face the only side beneath them in the table — UCD. As with Ollie Horgan’s team, there is a feeling that the Students are better than their results indicate, with good performances often going unrewarded. Cretaro watched their recent 1-0 loss against Sligo and felt they would have got something from the game were it not for the heroics of young goalkeeper Mitchell Beeney. Both UCD and Harps gained promotion from the First Division last season. But despite their lowly position, Cretaro feels their opponents have the “psychological” edge ahead of this evening’s tie. The teams met on four occasions last season, with the Students winning three and drawing one. “We know it’s a big one,” he adds. Nonetheless, such pressurised situations are nothing new for an experienced campaigner like Cretaro. If anything, he relishes them more than ever, given that he is much closer to the end of his career than the start. When I speak to people, the big thing is ‘play for as long as you can’. I just love the game. I love playing it. I love training. I love everything about it. I’ve been lucky enough for it to have been a big part of my life for the last 19-20 years at this level. Notwithstanding Cretaro’s immense drive and continuing thirst for success, his body has inevitably suffered plenty of wear and tear over the years. It is therefore essential that he manages himself appropriately from a physical viewpoint. “The big thing is staying fresh,” he says. “Ollie probably does have to pull me out of training because I’m that kind — I don’t like to miss it. He sometimes has to say ‘step out tonight’. It’s going to be quite intense after an intense day before. I’ll listen to him, I’ll take that totally onboard. If I feel I need to do something extra, I’ll do it. Another change saw Cretaro switch to part-time football amid the move to Finn Harps, and he is enjoying this transition. I’ve a newborn who’s a week or two old. It’s given me more family time. I’m home a little bit more with my wife and kids. That doesn’t mean I’m not on the lookout for something as regards work, because obviously football doesn’t go on forever. You’ve got to make that transition. I’m on the lookout and please god something does come along the lines of staying in the game. Whether that’d be coaching or whatever it may be, that’d be fantastic. I feel I have something to give back to the game that I got so much from. Whether that be coaching or media work, I’m open to everything. Football is my passion. But regardless of what happens between now and the end of his playing career, Cretaro’s many impressive feats over the course of two decades will ensure he is remembered by League of Ireland aficionados for many years to come. “The biggest piece of advice I can give is stay hungry and passionate. Football brings a lot of ups and downs. The way I have seen it throughout my career is you never lose, you learn. “Don’t beat yourself up if things don’t go right. Just knuckle down and do your best to make it right the next time. Having a positive reaction from any circumstance, whatever that may be, is vital going forward in your career. Email “'I'm 37. I'm still hungry. I go out onto the training pitch wanting to be the best player'”. Feedback on “'I'm 37. I'm still hungry. I go out onto the training pitch wanting to be the best player'”.